Russia in the 1840s seethed with intellectual radicalism. The reactionary government of Alexander I and of his successor, Nicholas I ,had dispelled all hope among the intelligentsia of reforming Russia, and both Westerners and Slavophiles sought ways to eradicate the recent past and to found a new Russia, new in government, in social structure, and in philosophy. Pavel V. Annenkov was an intimate friend of the radical intellectuals Belinsky, Herzen, Bakunin, and Botkin as well as of the foremost literary figures of the day Turgenev, Tolstoy, and Gogol. 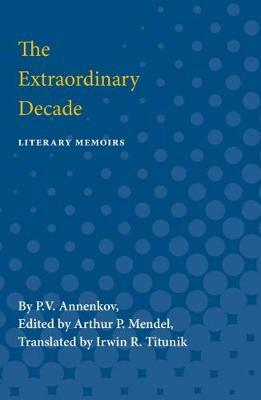 In his memoirs, Annenkov gives penetrating insights into the nature of this ""extraordinary decade,"" the 1840s, and personal portraits of the many famous men who made it extraordinary. Annenkov focuses on his good friend V. G. Belinsky, the influential literary critic and political philosopher. He analyzes the critical relationship between Belinsky and Gogol and the events leading to Belinsky's writing of his famous letter to Gogol; he demonstrates the influence of Hegelian philosophy on Belinsky's life; and he tells how the effect of Lermontov's writings finally led Belinsky to change his whole outlook. Being a great traveler, Annenkov was aware of the political and intellectual currents of the day throughout Europe, and in the course of his memoirs he describes the effect of politics on different modes of contemporary thought as well as the effect of European thought on the Russian intelligentsia. Annenkov himself was not a radical; he preferred to remain detached. But his recollections convey all the immediacy of a decade of intellectual ferment, and his observations provide not only an intriguing picture of Russia in the 1840s but also opportunity for comparisons with later decades in Russian history.